The Crab Nebula is the result of a supernova explosion that was observed by Chinese astronomers in 1054. It shined so brightly that it was visible during the daytime for over three weeks. The nebula itself was first observed by John Bavis in 1731. Later (in 1758), Charles Messier observed this object as he was searching for Halley's comet. He initially thought he had found it but later realized that the object was not moving in the sky. He then thought that it would be helpful to compile a catalog of objects that could potentially be misidentified as comets, making the hunt for them less confusing. 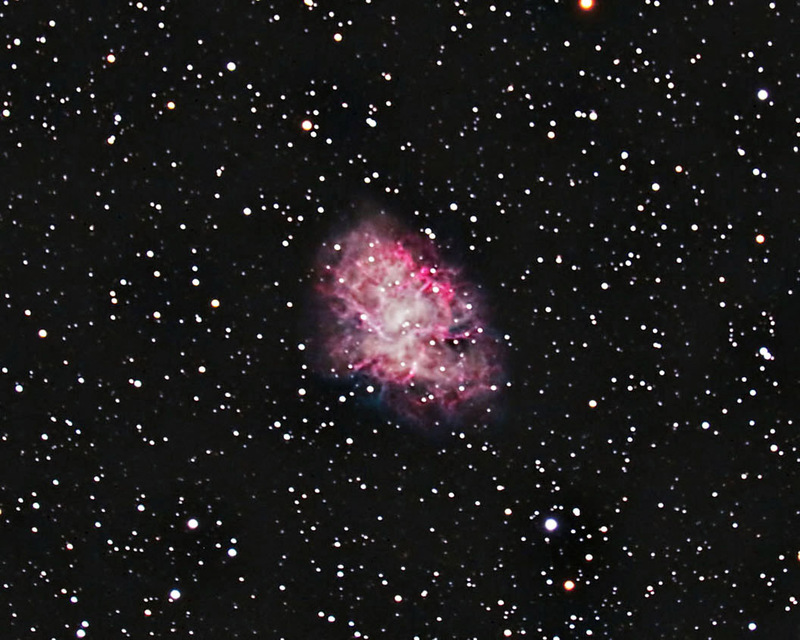 The Crab Nebula, as it now commonly known, became the first Messier object. Note: Images were focused with a Bahtinov mask, using the camera's live view function. They were calibrated, aligned, and combined in ImagesPlus. The composite image was then adjusted in Photoshop. DeNoise was then utilized. The final image represents a slight cropping as the orientation of the object changed over the two nights of imaging.